I have a custom component I would like to use in the store. Can NCWS install this device for me? A: Yes, most likely NCWS can do this. It does depend on your location and space allotment as to whether your component will work. Can NCWS create or produce graphics/art/signage for my store? A: Yes, NCWS can produce all types of artwork including vinyl, translucent backlit signage, silkscreen, posters and a lot more. Does NCWS have a catalog to send me? A: No,since we do not sell standard designs, NCWS does not have a catalog. 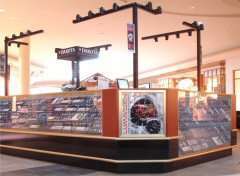 We are a custom shop, meaning all of our fixtures and displays are design specific to Customer and Mall requirements. What do I need to do in order to obtain a quote? A: Contact us or call us directly at 800.800.WOOD (9663) and tell us what type of kiosk you are looking for - food service/retail/other - a detailed description of the components you want in the kiosk and the location. Our experienced sales representative can provide you with a detailed quote based on your requirements.